Trevor and my student Theo have left, headed back to Pretoria. Theo is doing his honours (4th) year project looking at the distribution of bottlenose dolphins in the bay, and particularly how their behaviour varies in different areas. It’s still in progress, but by the end of the year we’ll have a much better idea of what’s happening out there. Ruth has now arrived from the US – with hydrophones (C-PODs) in tow! This is great news for us as they are rather expensive and we’ve been struggling to get them funded. We have eventually been successful through a Matching Grant from the NACOMA project (see links) in a joint proposal with the Ministry of Fisheries and Marine Resources. These instruments will be used for long term monitoring of the dolphin populations and habitat. The C-PODs (http://www.chelonia.co.uk/about_the_cpod.htm) are very new instruments and replace the older, simpler T-POD. Last year we borrowed some T-PODs from Simon Northridge at St Andrews University in Scotland to investigate dolphin habitat use at Pelican Point and got some very interesting and unexpected results which differed from the visual observations quite considerably. Ruth has worked closely with the manufacturers for many years and we also managed to get one of the very first C-PODs built to test (although there were many teething issues which thankfully now seem to have been solved). We’ve already put in one at Pelican Point and are really looking forward to what we see with the longer term deployments we’ll get this year. 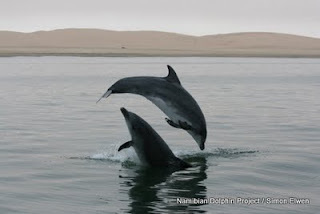 In an exposed environment like Namibia, the PODs are ideal instruments for long term monitoring of habitat use as they can stay in the sea 24 hours a day for months at a time, while we are limited to calm sunny days. We’ll be putting 2 more in the bay in the near future and 2 down in the Lüderitz area. Other than that, all has been going well. We’ve had a few days off the water with bad weather (or bad decisions on my part, but the weather forecasts here are about as good as throwing a dice) but the data is coming in. Lots of sightings of bottlenose dolphins, including some great jumping and socialing on one day which is always fun to see and photograph. 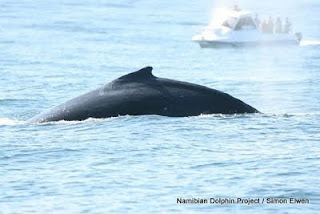 Heaviside's dolphins have been a bit scarce and whales too have been few and far between this year. There have only been 4 humpbacks since I got here and 2 right whales were in the bay last week but we missed them unfortunately.